Let me sing the praises of John, our new tour guide. Though he’s new to us, John is a longtime horseracing fan with an impressive store of knowledge and a deep-down appreciation of Old Friends’ residents, most of whose races he remembers. People volunteer at Old Friends for a variety of reasons. When I asked John his, he answered in one resounding word: “Commentator.” Now, there’s a reason I can’t argue with. John’s helping out on weekends, and besides all his knowledge he’s a great speaker who makes visiting the horses lots of fun, so here’s another reason to spend part of your Saturday or Sunday with us. Last Saturday a wonderful, memorable moment happened. Memorable as in, I don’t think I’ll ever forget it. As I took a group of visitors around, I pointed up the hill toward the back of the farm where Tinners Way and Williamstown were grazing in their neighboring paddocks. It’s a trek up the hill, unfortunately too long a one to include in most tours if people also want to see some of the most popular horses on the front part of the farm, so I often point out Tinner, whose brilliant chestnut coat is eye catching even from far away, and tell people they’re looking at Secretariat’s last son and one of his best, about some of his big wins and how in his first Pacific Classic win Tinner equaled his dad’s Derby record. Often Williamstown is hanging out toward the back of his paddock and it’s not so easy to point out this speedy son of Seattle Slew and recall the track record for a mile he held for a decade at Belmont Park. On Saturday, though, Williamstown was right in the front of his paddock, his nearly black coat and flashy white face and feet gorgeous against the green grass, so I introduced William from afar, too. 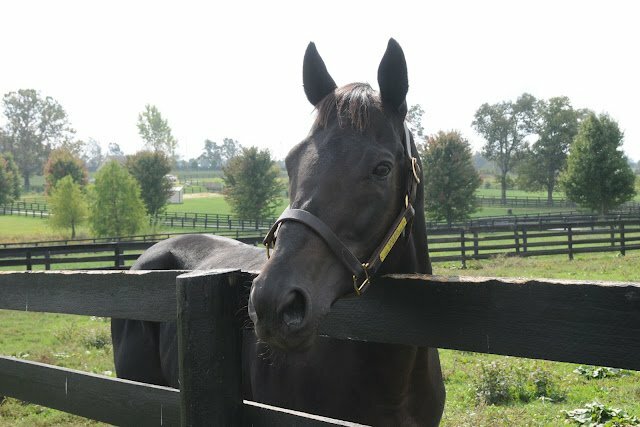 After the tour, one of the visitors told me she was powerfully drawn to the big, beautiful son of Seattle Slew. She asked if there was any way at all she could see him closer. Luckily, another guide was on duty and could take the next tour (thank you again, John!) so we jumped on the golf cart, negotiated the mud puddle in the run between Commentator’s paddock and Star Plus’ and found ourselves in an impromptu race along the fence line with Swan’s Way, which he won. Williamstown was standing by his fence, watching all this with his usual aloof dignity. William is an independent soul who keeps his own counsel. He’s also a bit tough. Cuddling isn’t his style. But I think even he was impressed by the impression he was making because he was all graciousness, as attentive to his new friend as she was to him. These two had such an immediate connection that he did end up accepting a little bit of cuddle, a rare thing from him unless he knows someone well. Sometimes it’s unexplainable why a certain horse has such a powerful effect on a person. In fact, inspires immediate admiration, even love. I only know that it happens, and it’s real. And that sometimes, whether sensing it or out of his or her own generosity, the horse responds in kind. I was privileged to witness such a moment Saturday and grateful to be in a position to help it happen. 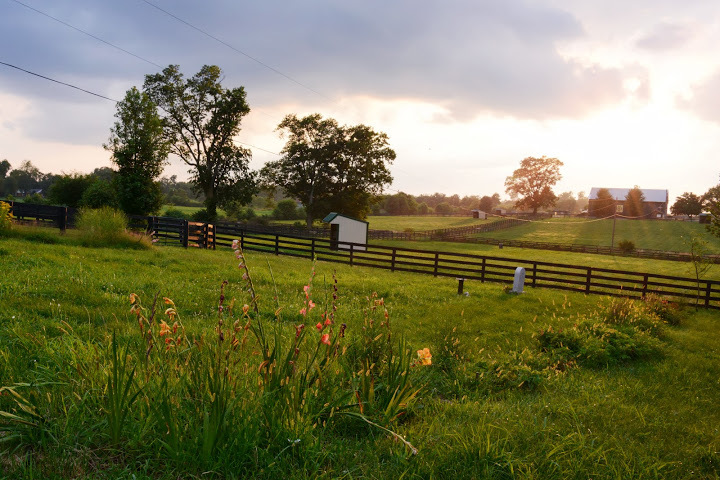 What a great summer we’re having at the farm! Plentiful rainfall ensures lush grass that all our retirees enjoy. Add to that lots of sunshine and numerous visitors with carrot treats, and I could almost swear our equine residents are smiling! Sarava hasn’t been with us a year yet, but he loves all the visitors and attention he receives. As we start our tours, he comes running. His paddock neighbor Gulch is more dignified and takes some time deciding between sweet grass and carrots from visitors. 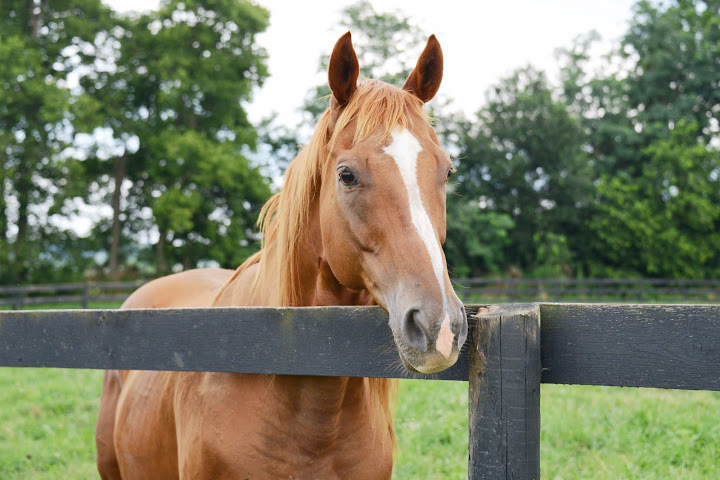 However, if 29-year old Gulch is at the fence, he expects to be fed first! The handsome Afternoon Deelites poses for photos and carrots. Paddock mates Flick and Danthebluegrassman, I’m Charismatic and Arson Squad, and Popcorn Deelites and Special Ring are all best buds with their paddock mates, but competition can occur when it comes to carrots and attention from visitors! All our residents have such delightful and different personalities! Come visit and see for yourselves. We’d love to see you at Old Friends. For all of you who have met and been charmed by our champions, thank you for visiting Old Friends. The forecast threatened rain and we started the day with only a few tour appointments on the book, but as the day proved sunny plenty of visitors turned up. Drop-in visitors for the 10:00, 1:00 and 3:00 daily summer tours are always welcome. For the afternoon tours Laura joined me, so as usual we split the biggest tour in two. Both groups got plenty of up close and personal time with the horses. Barbara held down the office with her warm welcomes for all. Michael spent the morning in his usual way. And what is that? On Saturday mornings he’s long been a regular on Horse Tales, a radio talk show hosted weekly by Ercel Ellis from the clocker’s corner at the Thoroughbred Center. Maybe you don’t know Ercel’s Horse Tales show? If you enjoy talk about horse racing and live in the Lexington area, tune into WLXG 1300 am at 10:00 on Saturdays. If you don’’t live nearby, you’ll find an archive of shows to listen to here. The show also features valuable information about horse health from the distinguished Dr. Doug Byars, Old Friends’ much-loved head vet. 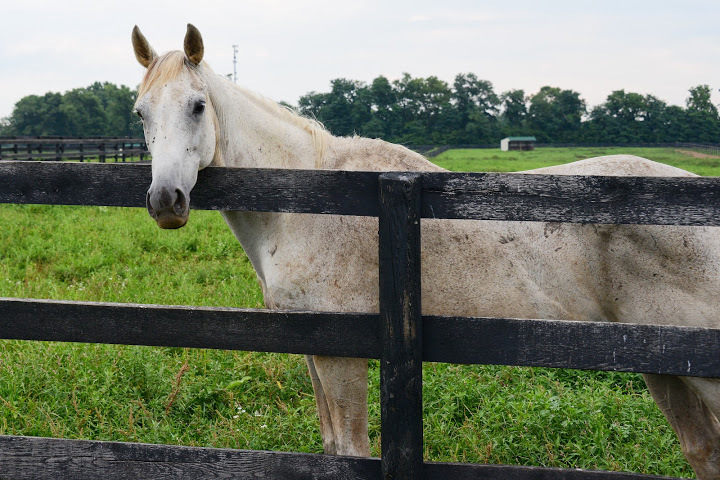 We’ve had generous help from several vets over the years, but above all, many of our horses have Dr. Byars’ profound knowledge and experience to thank for their health and longevity. He’s as great a teacher as he is a vet . Besides, he, Michael and Ercel are a hoot when they get going! Back home at the ranch, Sarava and Patton were pleased as punch to be over their stall rests, each having had a foot bruise, a common occurrence for horses in spring and summer. Both made up for lost time enjoying their fans’ attention and carrots. A few days earlier on Sarava’s first day outdoors he ran up to his fence whenever anyone passed, even in a car, announcing his return to his paddock. Another thing summer brings is burrs, especially along the outer fencelines of the farm. A bite of burdock now and then makes a nutritious snack, but there’s a reason they say that burrs were the inspiration for velcro! When they stick in horses’ manes the hair gets wrapped around the burr and before you know it the horse has a most interesting hairdo. Interesting, but not very flattering. This Saturday A. P. Slew had a prickly forelock and Delay of Game was sporting a rather unique coiffure. Both were pleased to get a little help from the Saturday volunteers armed with horse brushes, combs and the indispensible ingredient, Cowboy Magic. (If this sounds like a commercial for Cowboy Magic, I’d do one in a second if asked. It’s astounding how easily this stuff untangles the fiercest knots and make manes and tails silky. 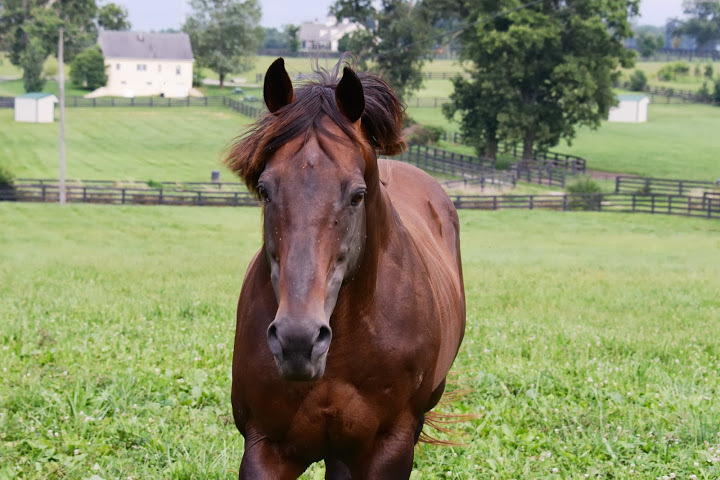 And now, back to our program…) “Squally,” as some of us call Delay of Game because he looks so much like a darker version of his dad Summer Squall, took a while to get combed out, but he stood by the fence hardly moving except to sniff us as if in approval. If he were a cat he’d have been purring up a storm! Here he is all combed out and silky. And here’s Mike the Spike, a grandson of Black Tie Affair, watching from his paddock opposite. Mike the Spike looks on. And Regal Sanction watching from his paddock at Squally’s other side. It’s definitely not all about the carrots at Old Friends. Friends is the operative word, even for a he-man like Afternoon Deelites. Afternoon Deelites just being Afternoon Deelites. 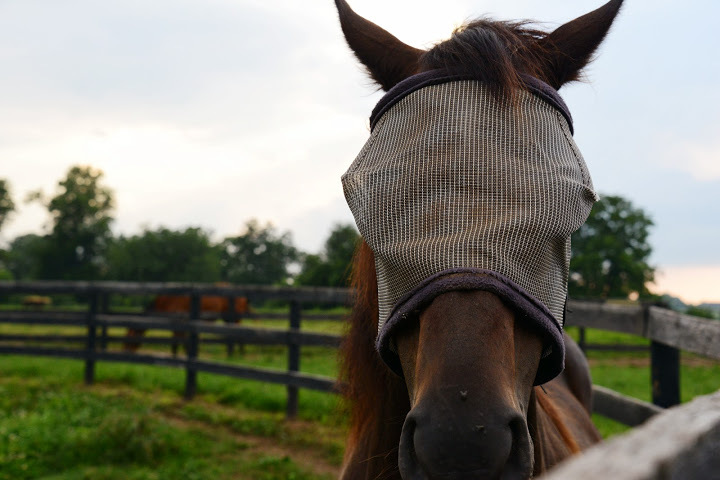 Speaking of Delay of Game, since he lives at the back of the farm fewer tours get as far as his paddock. Not fair maybe, but unavoidable with a T-shaped 92 acre farm. We like taking visitors to see the horses at the back when we can. The best chance is after the 10:00 or 3:00 tour, or when there’s more than one tour guide. But if you haven’t taken the trek to the back, here’s a little about Delay of Game. 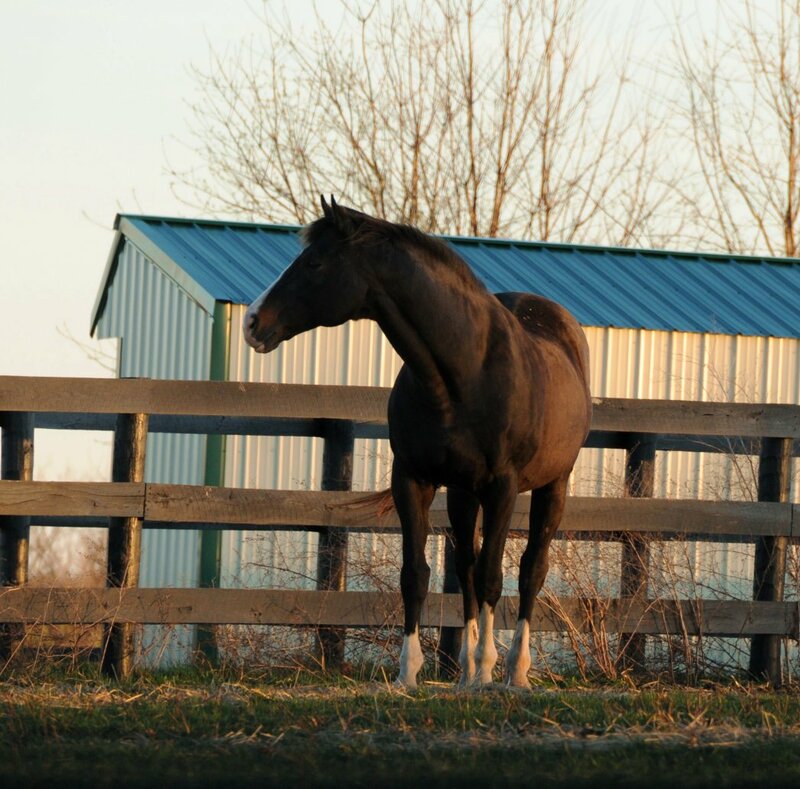 He’s a 20 year old dark bay gelding who raced on the Kentucky and New York circuits from 1996 through 2001. He favored a speedy, up front racing style. I remember thinking of him as a sprinter at the time, and he did compete in the King’s Bishop, Shadwell Turf Mile at Keeneland and other prestigious short distance races—and yes, he won on both dirt and turf—but his biggest win was the 1997 Stuyvesant (G3) at Aqueduct, a mile and an eighth. He was a long shot that day and paid $38, but he was a deserving multiple stakes winner and always gave his best. 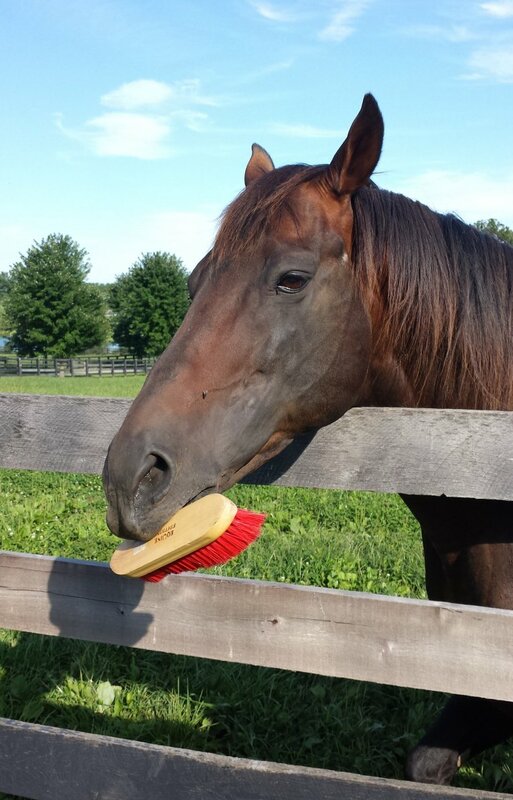 “Squally” has aged with quiet dignity and is one of the gentlest horses on the farm. If you know him, chances are you’ve lost a little, or a lot, of your heart to him. He’s a love, and he’s all class.